There was a parent discussion around a three-year-old girl who was giving her dad the cold shoulder. One parent suggested asking her if she would like to go to the store with him but if she said no then taking her anyway so that the two could spend time together. Whenever parents give a child a choice they need to be ready to abide by the child’s decision. Choose choices carefully! Since today is Beatrix Potter’s birthday, what can we learn about parenting from her story “The Tale of Peter Rabbit”? Peter’s mom was wise. She warned Peter not to go into Mr. McGregor’s garden and when he went anyway, he got into plenty of trouble. It’s always good when a parent’s warning turns out to be right! Like many children, although Peter had been warned, he still needed to learn from his own mistakes. Mom went on with her own tasks and did not try to prevent Peter from making a mistake nor did she come to rescue Peter. Peter suffered many natural consequences like losing his shoes and jacket, becoming lost and scared, getting sick and missing out on a good dinner. Peter’s mom avoided giving him a lecture and let the natural consequences do the teaching. Mom allowed Peter to learn a lot that day! Telling your children the truth may not always be easy but it is essential if you want to maintain integrity and trust in your relationship. One mom was taking her 9-year-old daughter on a cruise with various other relatives. Knowing her daughter was somewhat afraid of going on boats, she kept the cruise a secret. When the daughter asked point blank if they were going on a cruise, the mom denied it even as they were being driven to the cruise terminal. Obviously the daughter found out that they were indeed going on a cruise. If I had been the daughter, I would have felt angry and betrayed. How would you have felt? What would this have done to your ability to trust your mom in the future? If you want to build strong relationship with your children, honesty is part of the foundation. 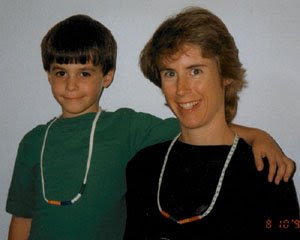 Michelle Nichols has established July 21st as "Hug Your Kids Day" in honor of her son Mark who died in 1998, at age 8 1/2 years old, from brain cancer. This special day is a wonderful reminder of how precious life is. 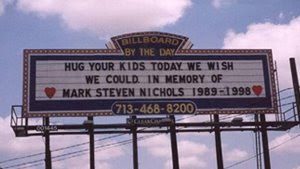 If you are lucky enough to be able to hug your child today, do it! In fact, make it daily habit; it's one habit you'll never regret. One parent complained that her child, Chris, often interrupted dinner with many loud, intentional burps. Her attempts at getting Chris to stop had only been mildly successful. What else could she do? What if Chris refuses to leave? Mom might state “That certainly is a choice. However, I don’t think it’s a wise choice because there will definitely be consequences.” Mom can then let Chris know the consequence at some later time once she’s had a chance to think it through. We recently returned from a 16 day trip to visit our families in Minnesota. We’ve made this pilgrimage at least once a year since moving to Seattle over 20 years ago. What draws us back year after year? We go back to reconnect with our parents, brothers, sister-in-laws, nieces, nephew, other relatives and friends. It’s a summer tradition for our family. The time we spend in Minnesota visiting is sacred. Sacred because it is a rare opportunity to connect with those we deeply love. While we could travel to various other summer destinations, our hearts always lead us back to Minnesota. When you see your children demonstrating compassion for others, it’s a proud parent moment. The video below shows compassion in action during a baseball game. The most basic form of showing respect is to use “please” and “thank you”. As parents it’s our job to teach our children to say “please” and “thank you”. I’ve seen a number of incidents where parents say thank you for their children but don’t actually teach their children to say it. For example, when parents pick their children up from a play date, they might thank the host while the child does not. When parents say thank you for their children, it sends the wrong message to the kids. Children who do not learn to show these basic courtesies are often disrespectful in a number of other ways. For example, one of my son’s friends was very disrespectful to his mom the first time he came over to our house. In front of her he announced she was stupid because she didn’t speak English very well. He was the same boy who neglected to thank me for driving him home after playing at our house. I explained to him that I would be happy to provide a ride as long as I was thanked. He chose not to say thank you more than once and so he no longer has a ride here to play. Parents, please teach your children this basic courtesy. Thank you! A mom explained to me that her 11-year-old daughter’s cat died suddenly one evening after getting into some poison. Her daughter was devastated. The daughter asked her mom to call some of her friends and tell them what had happened. Her mom made the calls. Her dad went out and bought a huge bag of candy and some chips for her. When our children are hurting, it’s extremely easy to use the Personal Assistant parenting style to try to rescue them from the pain. When mom called the friends for her daughter, although she was trying to help, she also sent an unspoken message that her daughter wasn’t strong enough to make the calls herself. However, telling others the story of how a pet died is part of the healing process. We want our children to learn that they have the inner strength to deal with difficult times. Watching our children go through painful situations is one of the hardest things we deal with as parents. It may be easier to avoid trying to rescue them if we remember that learning how to process grief is an integral part of growing up.